Welcome to our Hall of Shame, where the bad banks are shamed for some of their inappropriate actions. In March, before instructing JMP Partnership, Mr H gets an offer from Lloyds in respect of several accounts he had complained about. After doing that he gets £1452.54 refunded. NOTE where Lloyds tells him there is no PPI on account ending #1754. 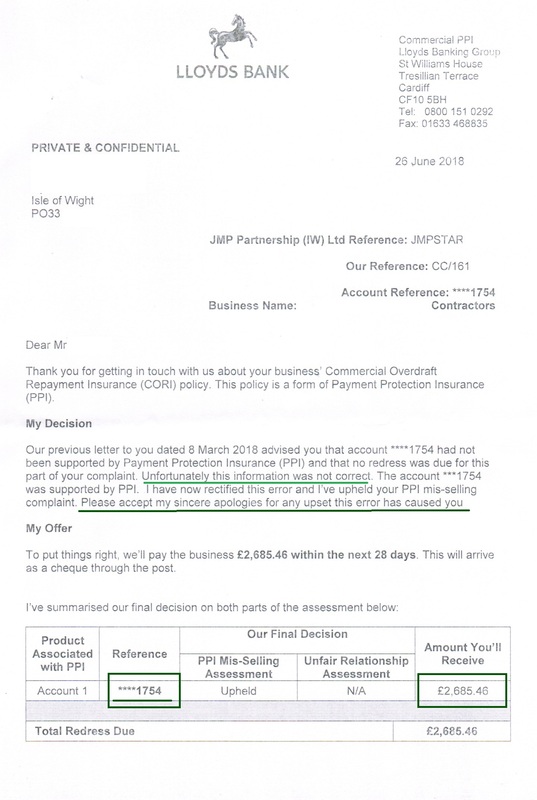 Mr H becomes a client of JMP Partnership in May and following further investigations by us and receipt of several hundred pages of documents from Lloyds, we catch them in a lie. 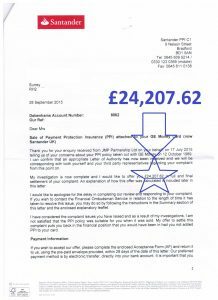 Account #1754 DID have PPI and he was due a further refund of £2,685.46! Credit where credit is due, they put their hands up quickly and admitted that they ‘made an error’ in March, but it is funny how almost NONE of the errors we spot resulted in the bank paying too much compensation? Business Customers of Lloyds Bank. 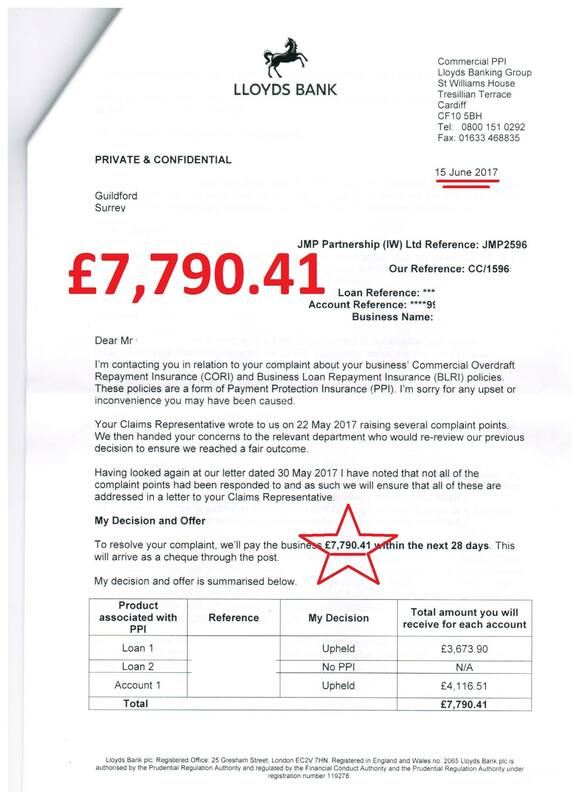 This is why small businesses use JMP Partnership to recover mis-sold PPI (Business Loan Repayment Insurance and Commercial Overdraft Repayment Insurance) from Lloyds. As the pictures below show, in December last year we got an offer from Lloyds in respect of policies mis-sold to our client in Surrey. He was delighted with the offer of £14,638.56 – BUT we weren’t. It appeared to us that the offer was significantly short of what it should have been. 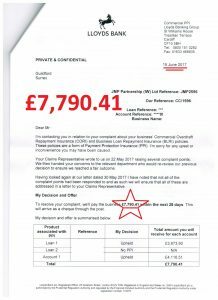 As you can see, following further work by us, our client has now been offered a further sum of £7,790.41 BUT that is not the end of it. Our ongoing investigations have identified ANOTHER policy that Lloyds had not disclosed on the initial investigation and that will result in a further substantial refund, in excess of £20,000 in due course. The ‘unreported’ Lloyds Banking Group scandal. 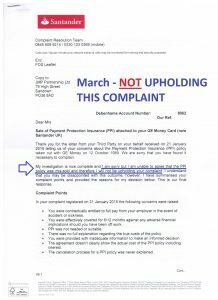 If you have used the services of a CMC, a claims management company (other than JMP Partnership) to investigate the sale of PPI to you by Lloyds or Halifax or Bank of Scotland, and you received a letter from them telling you that they investigated your accounts and you had NO PPI then you need to read this URGENTLY. It has become increasingly apparent to us that a LOT of other CMCs operating in this market have been relying upon the data they are being provided by Lloyds, Halifax & Bank of Scotland. They have been advising consumers that they did not have PPI on accounts that DID have PPI. What they should have done to ensure that your account(s) were properly investigated, was to raise a complaint in respect of ANY account that appeared on the ‘PIR process‘ that preceded 2002. Many DID NOT and tens of millions of pounds may be owed to consumers who have been told incorrectly that the accounts they had with these banks did not have PPI. 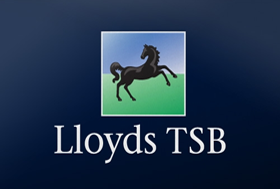 We have been working with Lloyds Banking Group to try and improve the reliability of the data they supply on the ‘PIR process‘ but until we can rely upon it, we raise complaints on EVERY account that we locate, including those they say ‘NO PPI’ as the status AND we file a full Data Subject Access Request and pay them for all the data they hold on our client’s accounts. The only way you can be reasonably assured that you definitely did not have PPI attached to your accounts with these banks, is to make a formal written complaint to them and trigger the regulated complaints process. You can either do this yourself, or if you’d like to become a client of JMP Partnership and have us do it, call us today using the contact information at the foot of this page. We certainly can’t promise to get you any money back, but we believe our processes are rigorous and robust in a way that other CMCs aren’t which enables us to assure you of peace of mind by the end of the process. 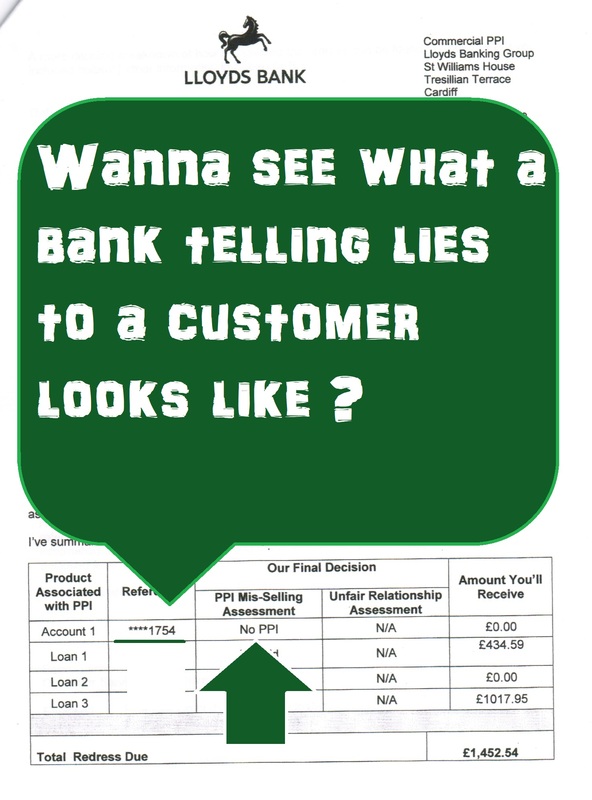 STORE CARD PPI – The ‘untold story’. Most store cards in the UK were previously issued by GE Money on behalf of a number of UK retailers including Topshop, Debenhams, House of Frasier and Burtons to name but a few. GE Money sold their store card business to Santander Consumer Finance and they subsequently sold it to New Day Limited. If your store card was taken out prior to 14th January 2005 (that’s 95% of store cards) then your ability to get a refund of mis-sold PPI is severely restricted. That is because none of these entities fall under the jurisdiction of the Financial Ombudsman Service in respect of PPI sales that took place before 14.1.2005. Santander reject a high percentage of all PPI claims in the first instance. HOWEVER,every week JMP Partnership gets refunds of PPI on store cards that were sold in the 80s, 90s and 2000s. When we escalate a PPI mis-selling complaint on your behalf, and Santander rejects it, we then escalate the complaint to the policy underwriters. The underwriters DO fall under the jurisdiction of the Financial Ombudsman Service. VERY few people know about this option and some of the cases we have won have resulted in HUGE refunds. The letters below show the difference that our knowledge made to one client in Surrey. As you can see the complaint was initially rejected by Santander. 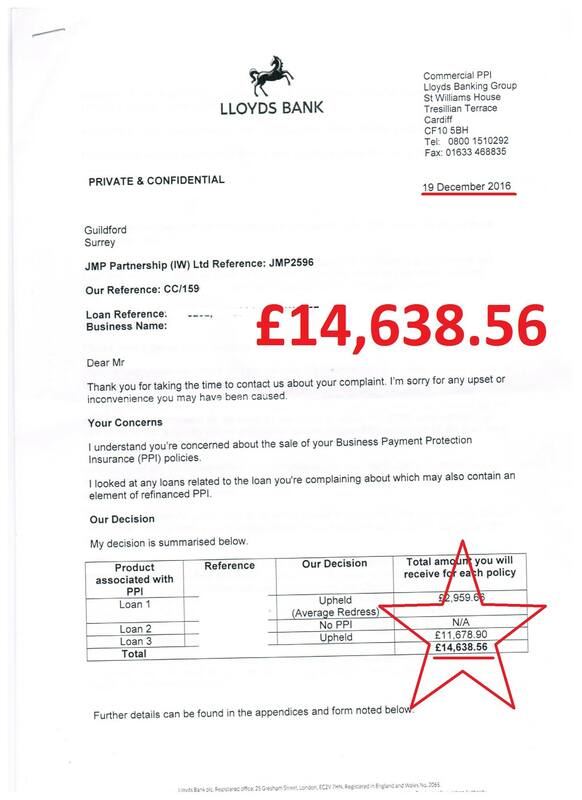 After we escalated it to the underwriters the decision was reversed and the client was paid a staggering £24,207.62. This result was so important and significant that the Mirror newspaper wrote a story about it. You can read the Mirror story at this link.